Writing for a Purpose is a collaboration between the British Council and Coventry University aimed at improve the writing skills of English Language learners heading to an English-medium university, specifically those in the UK. The project, funded by the Economic and Social Research Council, focuses particularly on the different types of academic writing that students are expected to write while at university and the purposes of the different genre. 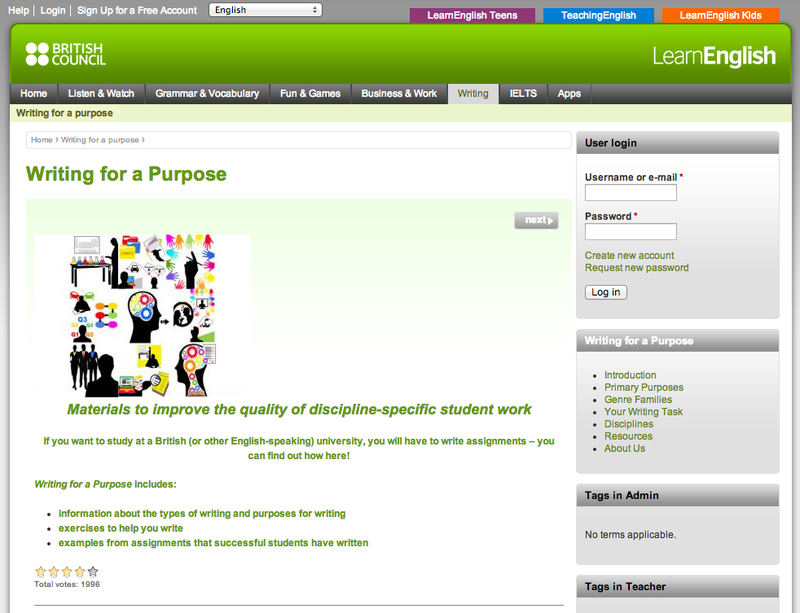 The product is part of the British Council Learn English website and consists of a large number of pages of explanation, audio, video and interactive exercises. Learners are taken through an introduction to the British Academic Written English (BAWE) corpus and how it informs the course itself, before getting more detail about the various purposes involved in academic writing and the genres that match these purposes. There is then detailed information and practice relating to the structures and vocabulary used in the different genre. All the interactive activity is done through the web app and scores are given to the learner based on their proficiency at each task. The information is aimed at higher level learners, presumably B1+ and it is completely free to access and advertisement free. The website is not responsive to mobile. The pros of this product are very definitely in the quality of the academic content and the thought that has gone into the needs of non-native English speakers heading to universities in the UK. The depth and breadth of the subject matter is impressive and has clearly been worked on by experts in the field of academic writing, specifically the kind expected of students at British universities; all informed by research and use of the BAWE corpus. There are detailed descriptions of the different features, structures and vocabulary used in the different genres and exercises that help draw learners’ attention to these aspects of writing through the exercises. In the vocabulary sections, there are links to concordance data from the BAWE, showing examples of the key phrases used that particular type of writing. 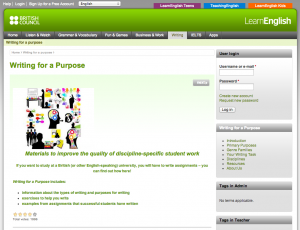 The fact that these materials are informed by a genuine corpus of student university writing and that they help learners with a whole range of different writing styles and purposes is impressive. The ability to distinguish between the different styles will go a long way to helping learners produce appropriate texts when at university. It’s also really good to see a product that is preparing learners for a very specific need and one that many learners struggle with. By focusing very clearly on one specific problem, the product has potential to offer some real value to the user in that space and prepare them for their time at uni. In terms of learner autonomy, the product requires learners to navigate around the exercises at their own pace and gives a lot of agency to the user. This may not be appropriate for all learners but it serves learners well for when they are in higher education and the site could act as a useful reference for learners throughout their time at university. The fact that the information is completely free to access is also a big plus and makes the content accessible to a wider range of people. As for the cons, they are mostly concentrated in the Instructional Design and User Experience sections of the review criteria. There is such a lot of information that it is often hard to know exactly what you are supposed to do or the order in which you should complete the activities. Hyperlinks take you out of the linear flow and to completely different places in the course so learner have to decide whether to carry on from there or go back to where they were. There are multiple pages, with multiple tabs and information on each, so learners need to take care with how they navigate around so as not to miss anything. The pages are busy with surrounding information that can often act as a distraction and take users away from the task. Scores are provided for the exercises but this isn’t tracked and learners are unable to see where they have got to or what they have done within the programme. So when they return they have to decide where to start from and are unable to track their progress with the content. 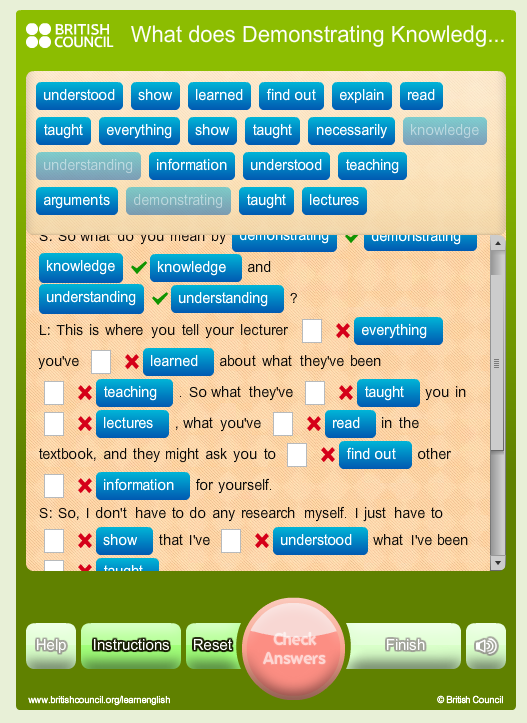 There are also no prompts for the learners to actually write anything. Understanding of appropriate vocabulary and structure are tested indirectly, but there are no opportunities for output. Clearly it’s a challenge to automate the marking of learner writing, but it may have been good to give learners sample questions that they could try in their own time or even offline. The product is aimed at high-level learners but some of the content does seem unnecessarily academic and maybe in more detail that the learners would need, especially if they were just starting out on their academic writing journey. This sometimes adds to the feeling of being bogged down in information and hard to know what is expected of you as a user. This seems to be an example of a great quality learning product packaged in a way that is unlikely to see many users go the distance and get as much out of it as they could. You can see that the early pages of the product are well commented on and have a lot of ratings, but this drops off drastically as you progress through the course, suggesting there is a very high drop off rate in terms of product use. The usability is so confusing it really is genuinely hard to know what is expected of you at different points, and in fact, some of the early comments from users are actually asking for some clarification about what to do and how to proceed. There is some really interesting and detailed content and some great exercises; and the fact that the product is informed by a corpus of student university writing acts as a really solid foundation for the educational content in the product. Indeed the content would definitely make great lessons when administered by experienced teachers, with an idea of how to make sure that it was displayed in an engaging way. Unfortunately, the structure and the format of the content online is unlikely to engage learners in the same way. There are some great indirect tests of learners’ understanding of the structures of texts and a lot of useful data about the words and phrases commonly used in the different genre. It seems a shame though not to encourage learners to actually write something, when the product has the goal of improving writing proficiency. A classroom setting for the same content would have likely resulted in more opportunities for output and personalisation than are possible here on the site. It would be great if some more effort had been put into the usability and how to manage the cognitive load from an instructional design perspective, so that the product could have felt more like an actual product. At the moment it feels a lot like a collection of web pages; it’s clear that could really, really help, but I imagine that most learners wouldn’t stay around long enough to find out just how much. If BC promoted open-source, different coders/teachers/students could jump in and re-iterate the code, suggest and discuss changes. So, a community could potentially rally around the product and continue the development. But, this isn’t possible. yet, the apps they produce are proprietary. I think BC should revisit their ‘purpose’ and consider the benefits of open source and community before proprietary. The Economic and Social Research Council who funded the app should consider making open source a prerequisite for all project funding, after all, they are working for ‘social impact’ which means the people with the lowest income are afforded a role and an equal voice. With proprietary based software the opportunity to participate is lost. You gave this site an average of 3.5 in terms of cost and access. This means it is nearer to the mean than it is to a top rating. 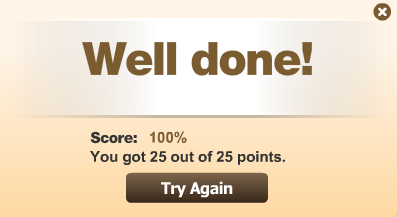 I honestly don’t understand how such a low score can happen with a free site. If an equivalent site charged me $9/month for this content (or its like) this site would cost me $120 over the course of a year. For the target demographic this probably means in the range of 20 hours of work to pay for such a site. For access to rise to the level of being a problem I’m thinking that the process of accessing this site would need to be very painstaking to begin to negate the HUGE advantage of being free (and yet you didn’t mention this painstaking process). Also, how do you measure the variables in this section. Do you try to sign up yourself and then measure how long this takes? Are you perhaps knocking this section down based on bad experience that instead should be accounted for in other areas (user experience)? And would it be possible to hyperlink each category to your measurement criteria in the future? I am completely lost with regard to understanding what a star means especially when two factors are combined into one measure (cost AND access). Firstly, access relates also to the level and complexity of the language. In this case I felt that the language was overly academic at times and therefore a barrier to access the content for someone who wasn’t a proficient speaker. Some of the texts and videos are the kind of thing you would expect to see in an IATEFL talk aimed at experienced EAP teachers. So that would have an impact on how easy it is for a B1 learner to make the most of the resource. Secondly, access relates to the level of localisation in the product. In this case there isn’t any, which is understandable in that it’s aimed at higher level learners, but given the initial comment about the academic nature of the language, this was noted rather than being marked as n/a in the criteria. It would be of some benefit, for example, for a Chinese learner to have activities which encourage them to focus on the contrasts and similarities between the expectations of academic writing in China and the UK. Such localisation isn’t present in this product. You’re right that difficulties in signing in etc would be scored primarily under the UX category. I hope this helps explain things a little better. Sorry for all the questions…..your scale really fascinates me. Given what you just mentioned about access it seems to have more in common with user experience than cost. Don’t you fear muddying the clarity of such a measure by combining two things which potentially have nothing in common (like above)? Hi Mike, no problem; always good to get questions. I guess the reason to combine them was that they relate, broadly speaking, to how many people can access the product, how many people could theoretically benefit from it. Once they are in there, the UX, instructional design and pedagogical aspects are taken into account. But you’re right that many of these things combine and interlink. It’s impossible to completely separate but I feel that having the categories gives a good overall impression of the strengths and weaknesses of a product. Maybe, i am mistaken, but as you explained it above it sounds like access refers to things that are “in there” which means it shares more in common with user experience. Also, if you measure access in terms of how many people could benefit from the product then any product would have to be weighted in favor of two countries, China and India as these have the most potential users. Any product that is outside the Chinese firewall should probably be automatically graded down as that limits access to a huge pool of students. Then too, if you measure access by just one page you need to take into account if google translation would ameliorate these problems. In light of google translate, how does this change things? Interesting I think I came up with an overall score of 3.25 instead of 2.9 if access were combined with the user experience figure. This all goes to show just how complicated handing out numbers can be. oh, I forgot. Keep up the great work! The headline interested me. “Purpose” is now being used in varying ways related to the future. The new purposeful person is community driven, free and open access. Purpose is connected fastest growing economic market in the world right now, the ‘creative economy’. Imperative have coined it the ‘purpose’ economy. I´m not sure that it’s coincidental that British Council chose this word in their marketing headline, because it is connected to passion and creativity. But, the creative economy is open source, sharing, and propagates through word of mouth. The student does the marketing. The underlying theme being ‘social change’. I see BC promoting English as a ‘commodity’. Of course it’s only my perspective, but I don’t see much evidence to show an underlying imperative which represents ‘social change’, or corporate social responsibility within their DNA, do you? So, they limit their market appeal from the get go. Localisation is important and normally quite costly, but in open source it’s free. People from around the world can contribute to the product design. And that’s where the community can develop around the product. Oops I´m wrong again. British Council are doing heaps to contribute to the creative economy, wow! But, Writing for Purpose isn’t open source, which is odd. So, they promote it, but don’t practice it? 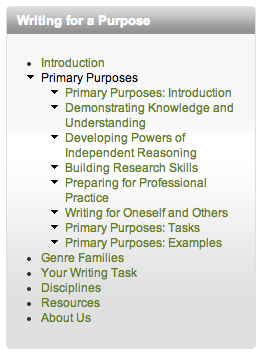 I am just pleased to see the genre-approach to writing being embraced by the British Council. I don’t love that they used the Sydney School definitions of genres as I think using more commonly used labels like “cover letter” or “reflection paper” demystify the approach. However, I do believe that the genre approach is the Next Big Thing(tm) in ELT. At the very least, I hope it sounds the death knell for the five paragraph essay. And so to have a free, comprehensive resource targeted to students is wonderful. In terms of accessibility, perhaps one lesson they have not learned from Sydney is that the genre-approach can be used by lower-level students. In the US, it’s tended to be targeted to grad students and examples come from research papers or dissertations. I hope that changes and we start teaching letters of complaint and tourist postcards from a genre-point of view. I have used the BC’s site a lot with uni groups on laptops. The general views are that it is a bit dated. This new app has the same issue. I have only looked at it but it seems to be the same. Maybe it is our internet connection too but exercises take quite some time to download and there are at least 2 or 3 student who cannot access them. Also, does this work on mobiles? I don’t mean to sound negative but I watch students using sites like this and then discuss their experiences afterwards. They need to be impressed visually, have a smooth user experience and enjoy it and learn something. When I float around class, I often see, as here, small exercise boxes with only 2 questions on and lots of space. On small notebooks, it is hard to see. I do hope these points get addressed as the content here and on all the site is VERY good but until it becomes attractive to young people, it will not appeal enough to some students. So, the students need to be able to hack the code from the site, re-imagine it and add smoother transitions – right? I was deep in thought this morning about ‘object’ based learning , variables, arrays, vectors, fill, color, text, font, and all the other language associated with programming – and concluded, yeah, this language is largely outside the domain of ESL and the students are seldom exposed to the language of code. Why not, interpolate ‘coding’ within the grammar of an English curriculum. ‘How are you?’ appears as a variable ‘voiced’: “How are you?” (and a programming ‘object’). Quite quickly the learner would engage with code on the screen of the computer, and then be able to examine the code and start tinkering with it. “Even the academic side of the university offers richer and deeper experiences than Deresiewicz thinks. Recreating a life or building an argument, analyzing a text or chasing a virus, in the company of an adult who cares about both the subject and the student, need not be a routine exercise. It can be a way to build a soul — the soul of a scholar or scientist, who ignores our smelly little ideologies and fact-free platitudes, and cherishes precision and evidence and honorable admission of error. One reason some graduates of elite universities look unworldly is that those universities still try — admittedly with mixed results — to uphold a distinctive code of values.